Sergio Perez thinks the heavy Halo cockpit protection layout and Pirelli tyres could be adding to F1's overtaking problem. 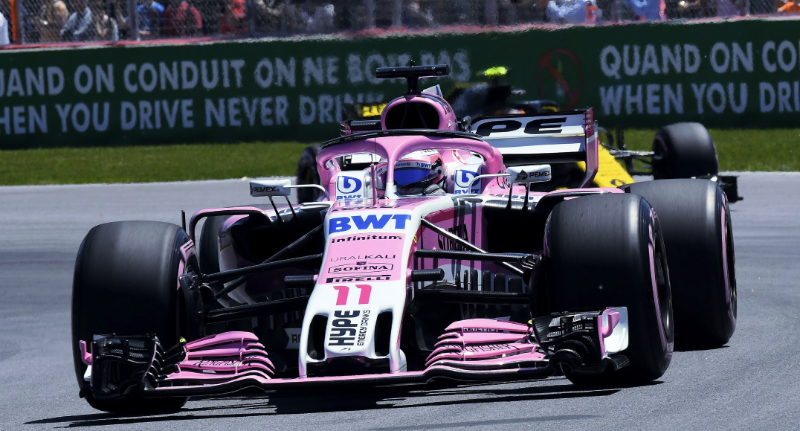 It is undeniable that last Sunday's Canadian grand prix on the normally exciting Montreal layout was dull. "We cannot disagree that qualifying in Monaco and Canada were more exciting than the races themselves," F1 sporting boss Ross Brawn said. "You expect that at Monaco, but in Montreal the winner is normally not decided until the very end." Sebastian Vettel said after winning in Canada that F1 has always been like that and always will be.
" I don't like how people today are so short sighted. We had seven races this year and I think some were phenomenal, some were boring. "But next week the World Cup is starting and I promise you that a lot of the games will not be exciting, but still people will watch it," the Ferrari driver said. And Brawn says that the exciting thing about F1 in 2018 is that the championship fight is close. "I agree with Vettel," he said. "Not every race can be exciting, even if that's what we're looking for. People will watch for the championship anyway. "Like Vettel, I'm also a football fan." Brawn said one solution Liberty Media is nonetheless working on is a budget cap, to bring the slowest teams closer to the powerfully funded front runners. But Force India's Sergio Perez thinks another couple of ideas would help. "I don't understand why it was so impossible to overtake," he told Speed Week after Montreal. "The cars are heavier this year because of Halo, and that doesn't help. But the pace difference you need for an overtake is enormous. "I think that as long as Pirelli does nothing dramatic, we'll probably always have boring races."